General: This is the island of Crete HP. 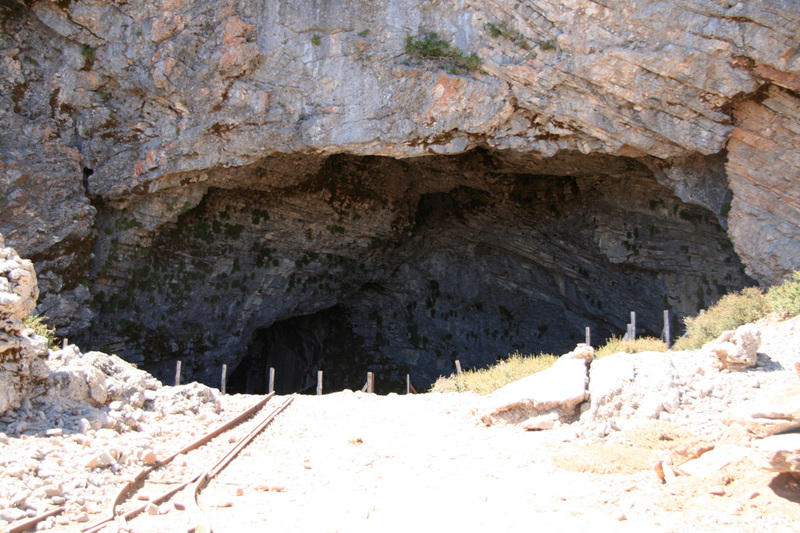 Location: In the range called Idi or Psiloritis, Island of Crete. 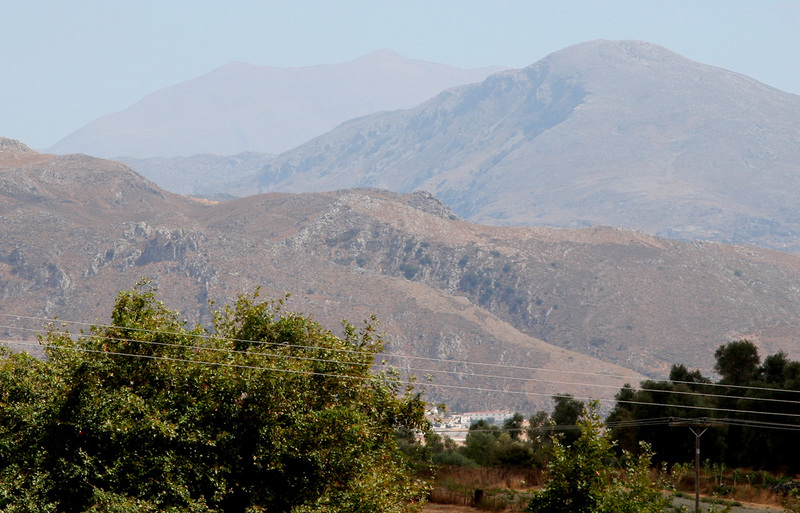 How to get there: This mountain is located fairly in the middle of Crete, when considering its east-west direction. Locate the very charming village Ánógia. It is located approximately 22 kilometer west and 6 kilometer south of Iráklio (on the north coast). 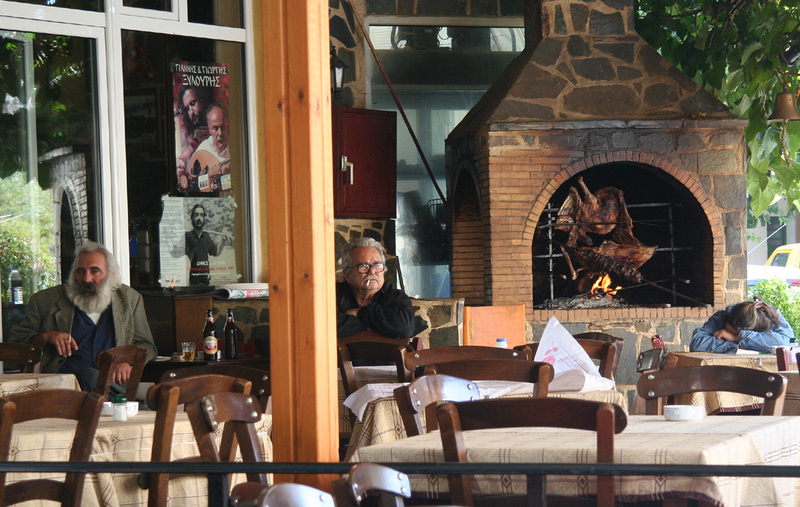 This is an excellent "base camp" with friendly people in local restaurants and inexpensive accommodation. 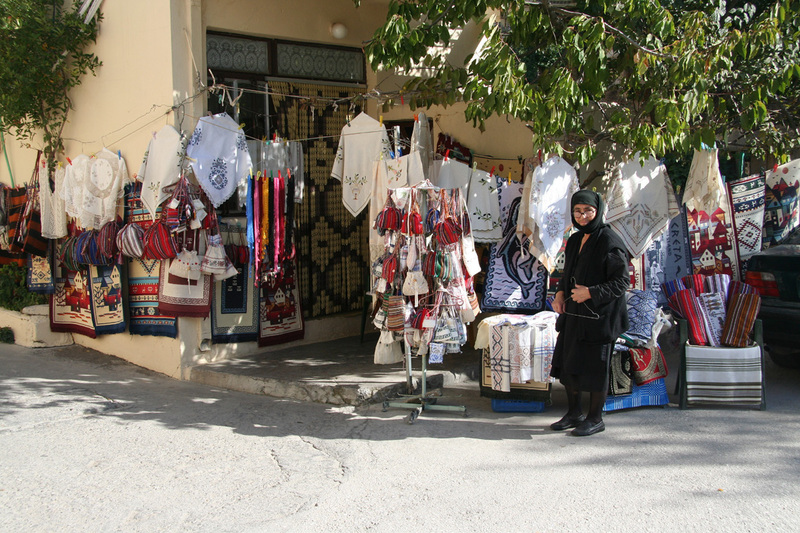 The village is full of products on display by the locals, I bought a small tablecloth with embroderies for Euro 10 and the lady did not know how to thank me, she shook my hand repeatedly and showed all signs of having closed perhaps the only sale of the day. I stayed in the lower part of town in a building near location N35:17.371, E024:52.847, elevation about 700 meter. Accommodation was 20 Euro, a two course meal with red wine came to Euro 15. Locate the road fork at the very top end of the village, location N35:17.130, E024:53.462 and elevation 800 meter. Coming from the village, take the right fork (there are signs for ski area etc.) 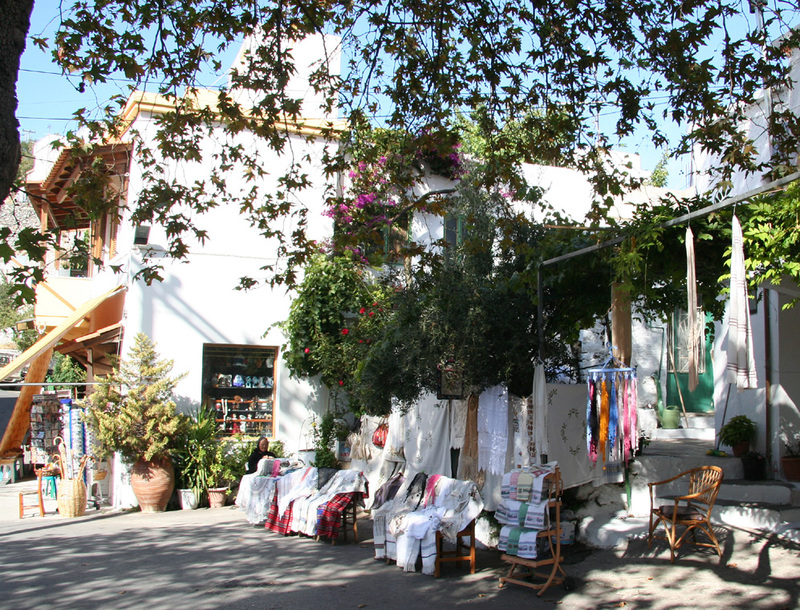 Drive approximately 20 kilometer along the main road until it ends with a parking lot and a building that holds a (pretty run down) "taverna". The road does continue as a dirt road, but there is no point in driving any further. This place is called Nida. Park here, this is the trailhead, location N35:12.403, E024:50.089, elevation about 1375 meter. Note: Based on my information before this trip, Nida would be the best (easiest) approach to this mountain. However, it turned out that most people seem to do this hike from the top of a dirt road that starts on the south side at a place called Kouroupito, elevation 1040 meter. 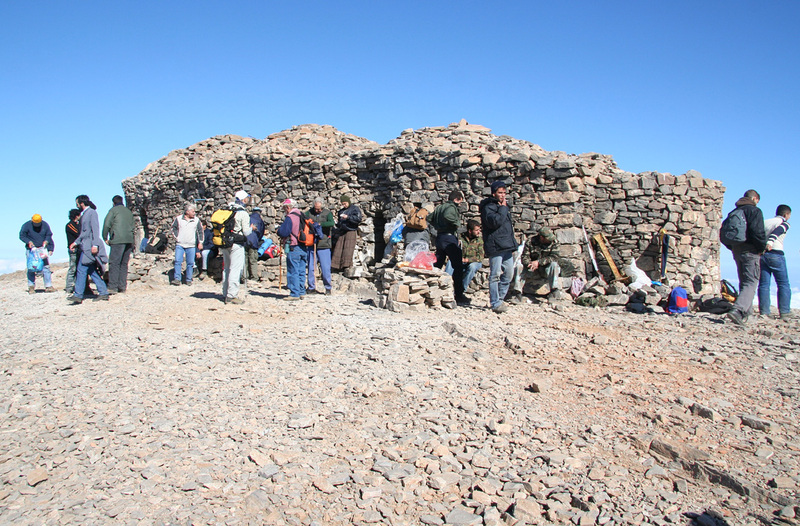 Kouroupito is reached from the village of Lochria, elevation about 600 meter. Lochria is located between the village Platanos (west) and Kamares (east). Access to these villages is from Hwy. 97 along the south coast near a place called Agia Galini. This dirt road takes you up to the main trail at almost 1800 meter. I hiked about 150 meter from the parking area, location N35:12.093, E024:48.642, elevation about 1840 meter, on my return hike to Nida. Unfortunately, I have no detailed information about how rough this road is. I spotted several cars, but mostly 4WD and high clearance vehicles. Route description: From the parking lot, follow the dirt road just a few meter and turn sharply right onto a smaller road that heads uphill. This road goes up to a small cave, however the trail leaves this road at its third sharp bend to the right (when counting the very first turn you made as the first one). Pay attention to this, I missed this point and subsequently never found the trail. This sharp bend is at location N35:12.217, E024:49.933, elevation 1442 meter. There is a cairn where the trail starts. Follow the trail as it traverses left in order to access a small valley higher up. The route enters this valley and follows it more or less to the top of the ridge, elevation about 1940 meter, location N35:12.272, E024:48.876. The trail forks at this point. One can take a right and cross the mountains pretty much directly in the direction of the summit. Alternatively, one can continue straight ahead, descend into the distinct valley ahead (where the other trailhead is located) and then follow this main trail to the right up the larger valley that tops out near the final section of ascent. This involves a loss of about 100 meter of elevation, but possibly a somewhat nicer trail. (The more direct route must also take a small elevation loss, of approximately 50 meter further up before the two routes again meet.) 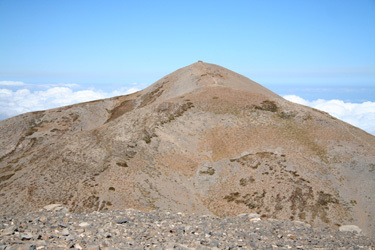 Towards the end, the trail climbs to the saddle between Agathias (2424m) and Timios Stavros, then the last slope to the summit. The summit is rather large and flat with a stone chapel placed in the middle. By coincidence, this summit was the 4th. summit with significant prominence climbed on the 14th. in consecutive months (June, July, August and September). Based on local maps as well as local signs, I conclude that the most proper name for this summit is Timios Stavros, while the entire mountain range where this is the highest summit, is called Idi or Psiloritis. I started out shortly before 0700 and quickly located the smaller road that climbed in zig-zag turns up the slope. I first believed that the trail might be this large (a small 4WD road) for quite some time, but then it suddenly ended at the entrance of a cave. Fortuneately, a trail continued, an arrow pointed further along with the letters "TS" (Timios Stavros). However, this trail quickly got very difficult to follow as it diverged into several smaller trails. 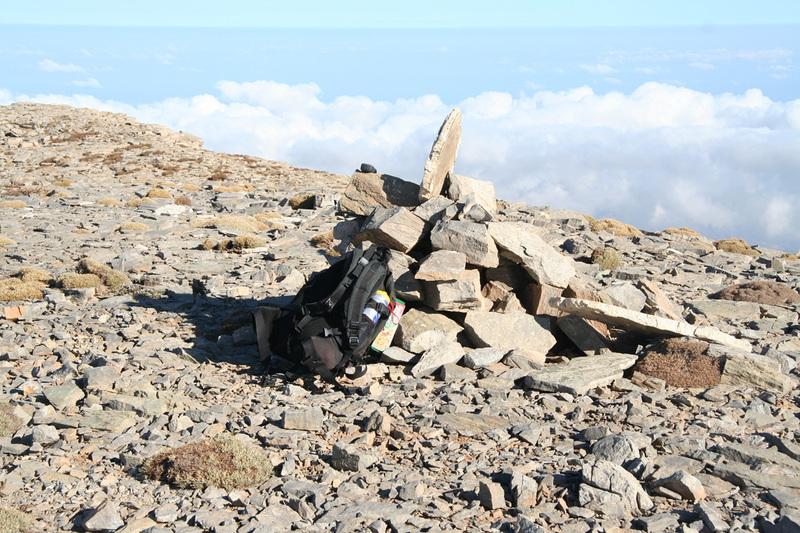 I headed uphill and spotted a couple of cairns here and there, but sort of understood that this clearly could not be the main trail to the highest mountain on Crete. There was really only one sensible option, the slope above me did not look impossibly steep, just forget about traces of a trail and random cairns and proceed directly uphill towards the horizon. The terrain was not perfect, but tolerable. Loose rocks and some better sections where progress was good. After putting in a good effort, I reached the ridge above and a much more gentle slope going right to a nearby summit. There was one issue that caused a slight concern. As I turned on my GPS, it told me that I was more than 5 kilometer from the summit and the summit in sight was clearly much closer. At least I now stood on top of the mountain that was visible from the car park. The time was 0830, so 1.5 hours of off-trail adventure had produced a summit, however not the one I started out to climb. This summit was marked with a standing concrete cylinder. It is named Kousakas, 2211 meter, and has a primary factor of 116 meter according to my GPS. I realized that this trip might turn out to involve more cross country hiking, including elevation change both up and down before reaching my target. I decided on "positive thinking": "Either you earn a new summit or your route to Timios Stavros will be easier by way of high connecting saddles" - certainly a "win-win". I proceeded to descend into the rather distinct saddle, then ascended a new top with a shepherds stone shelter nearby (approx. 2245 meter). Its primary factor was clearly insignificant as a very small descent got me further to a new summit (named Vouloumenou) that seemed more independent. This summit was marked with a small cairn. I measured the elevation to 2267 meter, location N35:13.345, E024:47.857, the time was 0910. My main objective was now clearly in view and I descended towards the highest connecting saddle. Here, it turned out that my last "trophy" only had a primary factor of 55 meter, so a true subsidiary point to Timios Stavros. I soon entered the first clear trail of the day and followed it to the summit. I had not seen a person since leaving my car and here on the very summit were about 50 people, all Greek. I soon understood that this day, September 14. is a special, religious day where people often do assemble on special mountains across the country. The summit church (rather a small chapel) was decorated, candles were burning etc. This structure, built from rocks, is about 4 meter tall (Hopefully it is not measured as part of the mountain!) 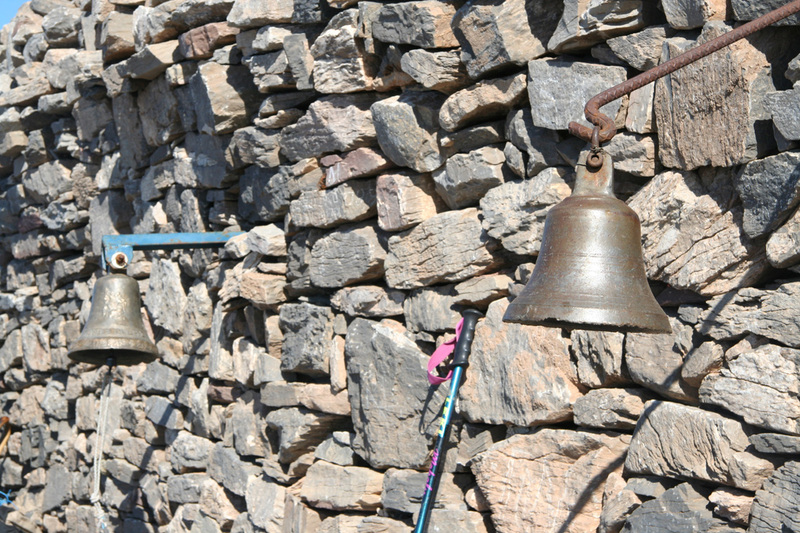 There are two solid bells attached to the outside wall. 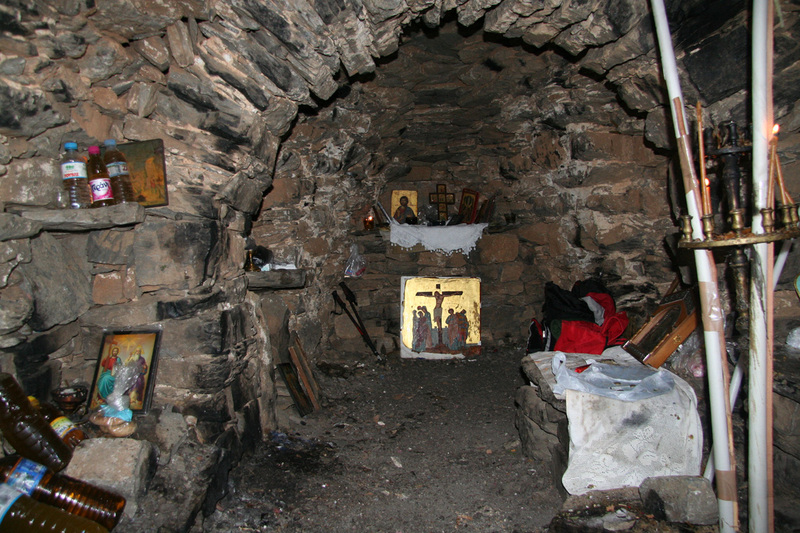 Inside, there are candles, pictures and similar Christian symbols. Many people also carried guns, handguns as well as rifles and shotguns. They would fire off a round now and then, this particular way of celebration seemed a bit odd and possibly prone to accidents. I hang around and watched the celebration for about 45 minutes before leaving in order to also visit Agathias to the south-east. This peak looked as it might have about 100 meter of prominence and my GPS gave a saddle-summit difference of 103 meter, clearly within the uncertainty interval. I spent about 15 minutes on the summit of Agathias, then decided to traverse the mountain and head directly south-east for the valley between this summit and Kousakas. I merged with the main trail and headed down on a pretty nice trail. Just as I thought it was time to leave the trail and head left in order to cross over towards Nida, two things happened. First, I spotted a trail marked with cairns and an arrow with the name Nida next to it. Second, I noticed that I was only about 150 meter from a parking area that had several cars. Clearly, one could access this mountain from the south. With a 4WD, this trailhead would be much closer to the summit than my alternative. Who knows, possibly this road can also be navigated by ordinary cars (driven with care). I continued across along my newly discovered trail. It took me nicely up to another trail fork from where one could head directly towards Timios Stavros, then down a small valley and finally a short traverse that ended in the last sharp right hand bend on my early morning road to the cave. This was certainly easy to overlook if you hike without a proper map. I was back near my car around 1300, a very nice 6 hour trip that took my to the summit of all 4 peaks above 2000 meter in this mountain range. Three ranked peaks and one named but unranked, by now I could draw an outline of the entire area, so hiking without a map carries certain benefits. 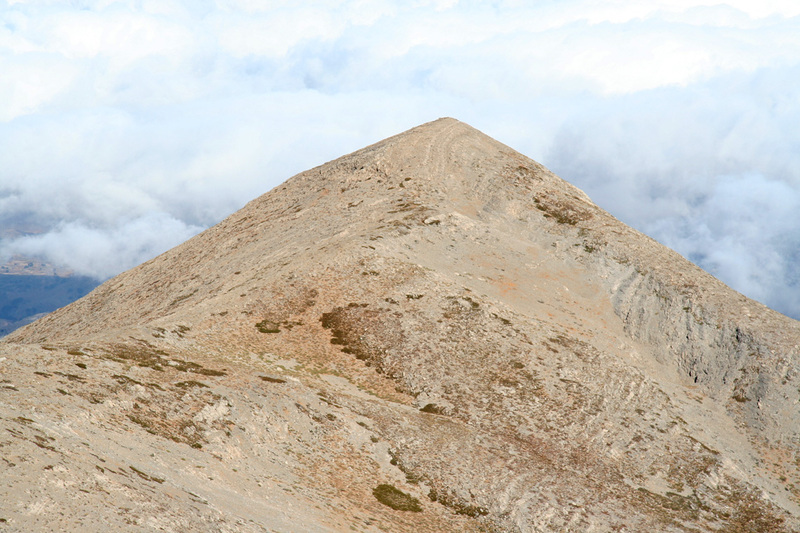 What are the elevations of the highest summits on Crete? The use of highly accurate GPS measurements makes it possible to check the accuracy of local maps (and "official statements" by governments). The official elevation of Timios Stavros is 2456 meter and the second highest summit, Páchnes is supposed to be 2453 meter. My measurement os Páchnes, was taken at 13/09-2006 at 09:00:57, and read 2446 meter at location N35:17.514, E024:01.929. This is 7 meter low, more than expected under such ideal conditions. The GPS was used with averaging for a couple of minutes. For Timios Stavros, I made 4 measurements, each employing averaging for at least 2 minutes. The measurements was taken on both sides of the stone structure (a small church, about 3-4 meter high) that is located at the (flat) summit. WP 201 14/9-2006, 09:59:05, N35:13.580, E024:46.250, elevation 2446 meter, Timios Stavros. WP 202 14/9-2006, 10:05:59, N35:13.577, E024:46.256, elevation 2447 meter, Timios Stavros. WP 203 14/9-2006, 10:26:53, N35:13.575, E024:46.263, elevation 2445 meter, Timios Stavros. WP 204 14/9-2006, 10:29:47, N35:13.585, E024:46.244, elevation 2445 meter, Timios Stavros. Thus, between 9 and 11 meter too low, again a larger than expected error. 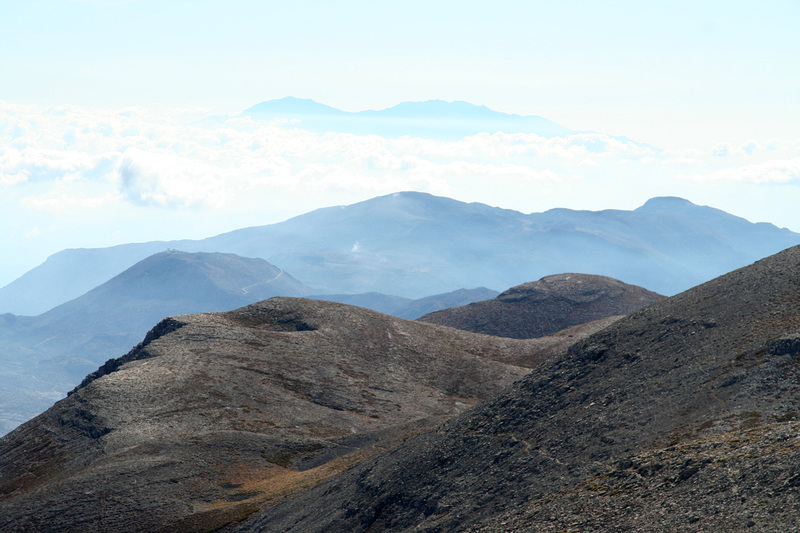 Similarly, the nearby summit of Agathias showed 2414 meter, while its map elevation is 2424 meter. Could this be a systematic error of about 10 meter relative to the GPS geoid model ? It is tempting to say yes, however on September 14. just before making these measurements, I also measured the nearby summits of Kousakas (GPS 2213 meter, map 2211 meter) and Vouloumenou (GPS 2267 meter, Map 2267 meter), seemingly in much better agreement. A careful check was made at sea level on September 19. The GPS showed -8 meter, consistently, so I guess the above hypothesis is largely confirmed, GPS measurements should be adjusted about 8 meter upwards. This leaves Páchnes measured to 2454m, and Timios Stavros in the range 2453-2455 meter, too close to call. A question that easily comes to mind is whether the elevation of Timios Stavros at least partially includes the height of the man made structure (a stone chapel) on the summit. With respect to Kousakas and Vouloumenou, either they are a bit higher than the map indicates, or I had a larger error due to a quicker measurement on these two summits (no averaging). In conclusion, these measurements are clearly not telling us which is the highest point on the island of Crete. With the close call, and unless more detailed information can be obtained, we shall continue to believe that the Greek authorities has this right, with Timios Stavros being 3 meter higher than Páchnes. 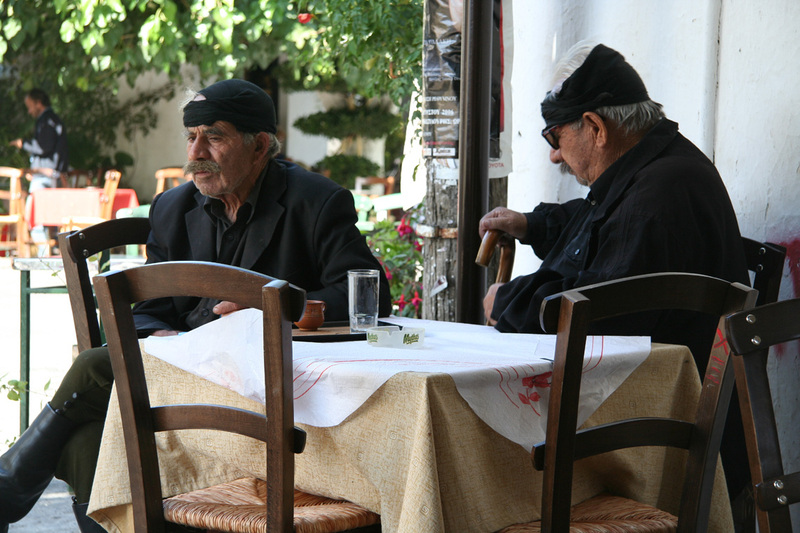 My trip on Crete continued with Afentis Stavromenos two days later. 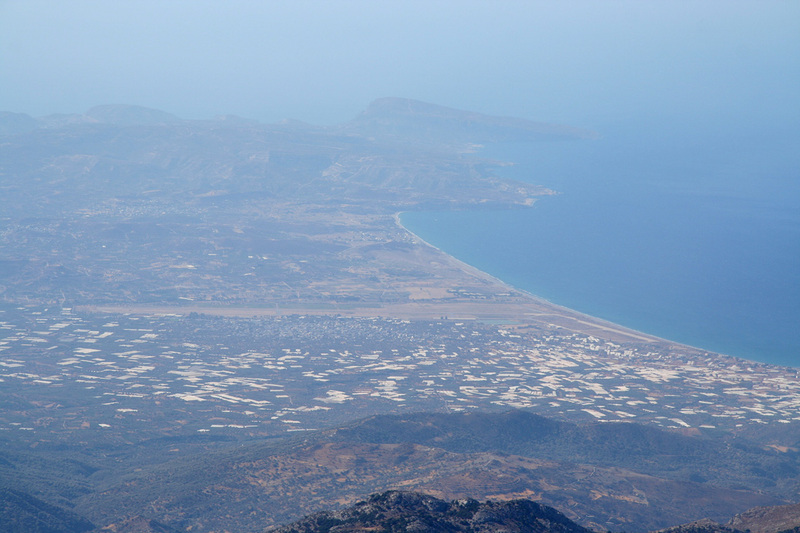 Timios Stavros, as seen from the air above Chania. Timios Stavros, as seen from the west. 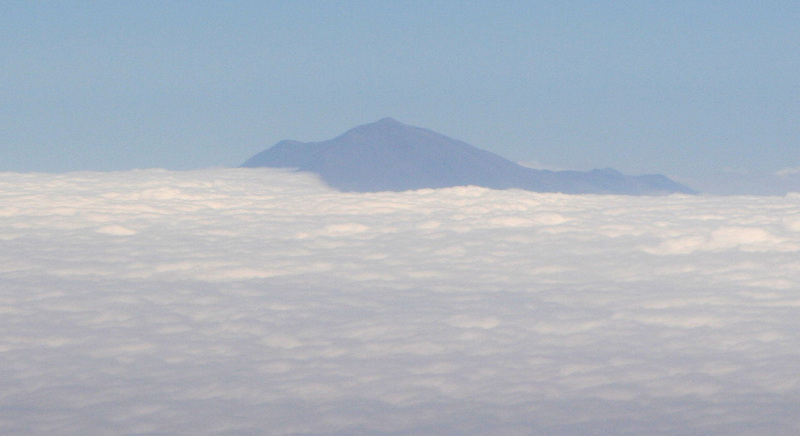 Kédros, at 1777 meter and with 1290 meter of prominence. Seen while driving from Páchnes to Timios Stavros. No time for this one. Stolistra, 2336 meter, the north-west spur. It has no prominence. Vouloumenou and Kousakas (in foreground) seen from Timios Stavros. Summit Panorama, the view is south-west. The island is N. Paximádia. The mountain massiv, seen from the road to Nida. Coastal view from the summit.